New Delhi, May, 2015: Great Lakes Institute of Management, Gurgaon, a premier management institute in the country, held its 4th Annual Convocation for the class of PGPM (Energy) 2013-15 and PGPM 2014-15 today at the Air Force Auditorium, Subroto Park, New Delhi. 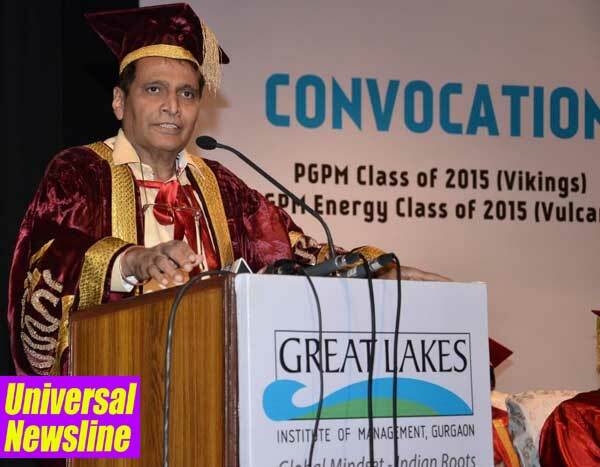 The event also witnessed commencement ceremony of the new batch PGPM (2015 -16) in the presence of Chief Guest, Shri Suresh Prabhu, Honorable Union Minister for Railways, GOI and Guest of Honor, Dr. Sudhakar V. Balachandran, Professor at College of Business Administration, University of Illinois, Chicago. The venue was brimming with energy reflecting the sense of anticipation among the students wearing ceremonial graduation regalia, waiting to receive their graduation certificates. At this year’s convocation ceremony, 105 students got graduation certificates out of which 38 students were from PGPM-Energy (Post Graduate Program in Management-Energy) 2013-15 and 67 from PGPM 2014-15 (Post Graduate Program in Management). The Chief Guest for the occasion, Shri Suresh Prabhu, Hon’ble Union Minister for Railways delivered the convocation address and handed over the certificates to the graduating students in the presence of Dr. B. S. K. Naidu, Chairman Emeritus, Great Lakes Institute of Management, Gurgaon, Mr. Mohan Lakhamraju, Vice-Chairman, Great Lakes Institute of Management, Dr. Himadri Das, Director, Great Lakes Institute of Management, Gurgaon, faculty, students and parents. Addressing the gathering, Shri Suresh Prabhu shared ““Every time we achieve a landmark, we start realizing that we still have to achieve more and that helps us to move further in life. We should never think that we have learnt everything and we don’t need to learn more. If we think that we have finished learning then probably we are never going to learn more in life. Going further, he added that the students who are graduating now are going to be highly benefitted by the growth trajectory that our country is currently going through. Even after reaching to the top in life, one must learn to bend to reach even higher and to enjoy one’s success. Bend and Mend must be the golden rule to follow in life,” said the honorable minister. Expressing his thoughts on the occasion, Dr. B. S. K. Naidu, Chairman Emeritus, Great Lakes Institute of Management, Gurgaon, said “advised students on stress management. He elaborated on the fact that stress has become inevitable in one’s life and it is imperative that we all learn how to curb the habit of carrying our stressful thoughts all the time. He further explained that by over thinking and worrying we only waste our time whereas by proper planning and with actions taken well in advance one can very much get rid of stress. Going further he explained that by understanding the importance of prioritisation of work and attending to urgent matters first followed by important ones and then the less important ones, we can improve our efficiency. “I am certain that all of you will take these lessons and skills you have learnt at Great Lakes and would prove to become responsible leaders and contribute towards better future for our country.”, added Dr. Naidu. As a part of the convocation ceremony, a number of academic honors were handed to the meritorious students. In the PGPM Energy batch, gold medals were awarded to Ms. Rekha Joy for Academic Excellence and to Mr. D N Sai Srinu for Best Outgoing Student. In PGPM batch, gold medals were awarded to Mr. Pawan Tripathi for Academic Excellence and Ms. Saakshi Singh for Best Outgoing Student. The ceremony was followed by a formal welcoming of the PGPM Class of 2015- 16 with the commencement address by Guest of Honor, Dr. Sudhakar V. Balachandran, Professor at College of Business Administration, University of Illinois, Chicago. Addressing the new batch, Dr. Sudhakar Balachandraninspired the students by sharing his mantras for achieving success. He expressed, “to reach heights one should not be easily content with achievements, we should always set higher targets and then must strive harder to reach those targets”. Further, Dr. Balachandran shared what he calls as “three ingredients for becoming successful”, first is to carefully set target that one thinks of as success and then taking steps to achieve the goal with complete focus without getting deviated. Secondly, one must perform all the duties without having expectations for results, in the end, it is not the result that counts but the perseverance, hard work, diligence and efforts involved in achieving the goal. Thirdly, the students must respect each other, their faculty and the curriculum they are going to study in the institute. The students of Great Lakes Gurgaon have also performed exceptionally well in several events and competitions and have won a sizeable number of them. Some of the achievements include publishing of case titled ‘Should Cairn India Venture in to Offshore Drilling’ at Richard Ivey, prepared by PGPM Energy students Ajay Srinivas Raghavan and Kartikeyun, the PGPM student Manoj Sinsinwar secured the 5th position in Snapdeal’s “The Next CEO” in the annual Management fest held at IIM, Lucknow, students of PGPM Energy Sushant Kadyan and Shashank received the best project award in the Eco Home Building Competition organized by International Youth Society and so on. The Energy Management class of 2013-15 was well received by the industry and the average compensation received was Rs. 8.74 lakhs p.a. with the highest being Rs. 13 lakhs. The batch of 2015 received a bouquet of offers from companies across Energy, IT, Internet Business, Consulting, Analytics and Healthcare sectors. The list of companies that participated in the process included names likes Aon Hewitt, Atlanta Energy, Bharat Light and Power, Cognizant, Deloitte US, E Valueserve, Genpact, HCL, HT Media, Indiamart, KPMG, Mahanagar Gas Ltd., NIIT Technologies, Shopclues, Sterlite Grid, Sun Edison, Window Force Management etc. The 1-year PGPM program (2014-15) graduates also had excellent placements across marquee companies with average compensation of Rs. 9.84 lakhs with the highest being Rs. 13.45 lakhs. Some of the companies that participated in the process were Cognizant Business Consulting, Deloitte, Droom, Genpact, Groupon, Zomato, Delhivery, Knowlarity, Maveric, MuSigma, ShopClues, American Express, PagalGuy, Makaan.com and so on. The profiles offered included Consulting/ IT Consulting, Sales & Marketing and Operations. Great Lakes Institute of Management- was founded in 2004 by Padma Shri Dr. Bala V. Balachandran with a vision of becoming the leading Management Institution in India providing Quality Education at an affordable cost and Human Capital for Emerging Economies. Led by exceptional academic faculty, steered by an outstanding advisory council and buoyed by the international collaborations, Great Lakes has, within a short span of 10 years emerged as a top-ranked business school, ranked 7th among 1 year MBA program by Outlook India, 7th under Executive Programs by Business Today, 7th among private B-schools by Careers 360 and 10th among top Indian B-schools by Business India in 2014. In 2014, Great Lakes was accredited by Association of MBAs (AMBA, UK) for its PGPM and PGXPM programs and became the youngest B-school in India to receive this prestigious international accreditation. Great Lakes has 50+ full time faculty and 130+ visiting faculty including over 20 international faculty from top global schools like Yale, Kellogg, Stanford, etc. Further collaborations with world's leading institutions like Stuart School of Business, Illinois Institute of Technology and MOUs with Nanyang Technological University, University of Houston, University of Bordeaux, University of Singapore, Bauer College of Commerce, University of Luxembourg, Georgia State University etc., have helped Great Lakes in globally benchmarking its programs. Great Lakes has a 27.5 acres LEED Platinum rated green campus in Chennai and a second campus in Delhi-NCR.